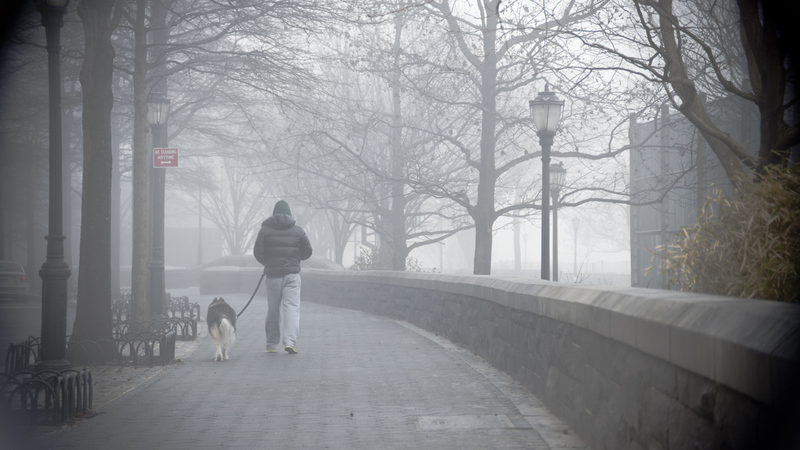 A little while back, in mid-January, we had several days of some incredible fog in NYC. It was so thick I couldn’t even see across the Hudson river to Jersey City let alone the buildings a block away. So it seemed like a good opportunity to go out and take some cool atmospheric shots. It was still relatively early in the morning and not many people had ventured out yet. But I can always count on the call of nature. And by that I mean, dogs need to go for their walks. So it was with this guy, and his owner. He was out letting his dog get a little exercise while also doing his business. I don’t get to shoot fog very often and it definitely showed in the pictures I got during that session. Everything is diffused, the light is low and nothing comes out particularly sharp. However, this particular worked out pretty well. And when you get everything balanced in the right way, you end up with a shot that has a timeless quality. I won’t say that this image is timeless but I do like the isolation of the man and dog against the diffused background of trees and I feel that the curve of the wall helps draw your eye further into the image, while the fog adds something lonely and quiet to the shot.